Manolo Jewelry » Drop Everything! Sometimes, a girl needs an emergency kit. I am talking about the emergency kit that you keep stashed at the back of your bottom filing drawer, that contains a few key items that can add a bit of evening sparkle to your daytime work look, should some unexpected social event land in your lap. We don’t always have time to go home and change. Nor do we always have the time/money/mental energy to go shopping for an entirely different outfit. Having a workplace emergency kit of fabulousness helps keep you from that panicked, “everybody will look great, and I’ll look like an office drone!” moment. It goes without saying that beautiful shoes should be part of this kit, but we’ll leave that category up to the Manolo, as he has recommended scores of mouth-wateringly beautiful shoes over the years. It’s the jewelry I’m talking about. Having one or two special, sparkly, lovely pieces stashed away for emergency events can make the difference between feeling confident and feeling invisible. 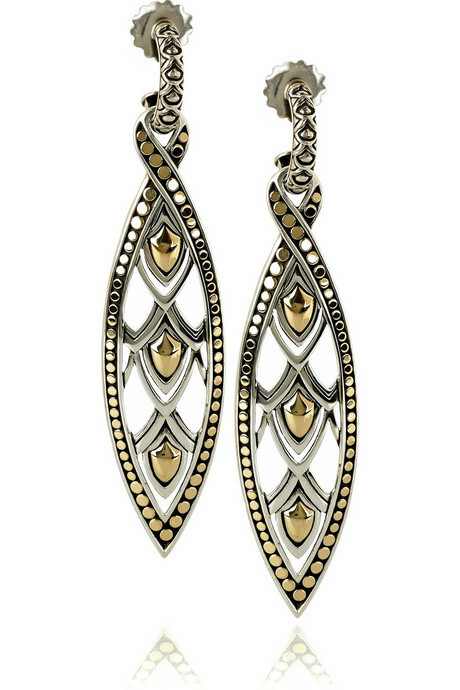 And nothing brings an outfit from day to evening like some drop earrings. I’m not talking delicate little pearl drops here, folks. If you’re going to put this kind of responsibility onto a piece of jewelry, it has to have the broad shoulders for it. These earrings, with their effortless mix of gold and silver, are strong but still somewhat airy, dressy but not TOO much so. I could totally see these becoming the workhorse of my evening jewelry wardrobe. These are fun earrings that can add a shot of colour to a neutral ensemble. Devastating with a smoky eye and pulled-back hair. These remind me a bit of rock candy sugar lollies…and that’s not a bad thing. They’re particularly divine this time of year: icy and gorgeous. Any of these (or the fabulous drop earrings of your choice) would definitely make a staid outfit MUCH snazzier, and at least make sure that you have no regrets about how you look. How you behave may be an altogether different matter, but we’ll just keep that between us, shall we? This entry was posted on Tuesday, November 16th, 2010 at 10:48 am by La Petite Acadienne and is filed under Alexis Bittar, Earrings, Gems. You can follow any responses to this entry through the RSS 2.0 feed. Both comments and pings are currently closed. Stop! I gave up on earrings years ago as I’m allergic to any metal that’s not superfantasticallyexpensive and what with losing backs (and then studs) etc, I gave up and let the holes grow over. Now I’m reconsidering…and like childbirth, the excruciating pain of piercing “couldn’t have been *that* bad”. Well you know, Jane…I COULD consider a post at some point soon about clip-on earrings. I’m digging those icicle earrings. I like earrings that sparkle the best, even though of course I’ve got lots that don’t. Jane, maybe they haven’t grown closed! I regularly go for years wearing clips or no earrings at all–and suddenly find earrings I love that I want to wear all the time. When I do, the holes are just fine. I don’t remember being pierced as I was an infant at the time, but I have never had to do more than gently put the earring on whenever I wanted to wear one. Perhaps it’s worth a very gentle attempt with a nice gold or platinum earring. Yikes! My deepest apologies, Jo. I’m still very new at this world of blogging, and most likely did not insert the link correctly. It will be rectified posthaste!